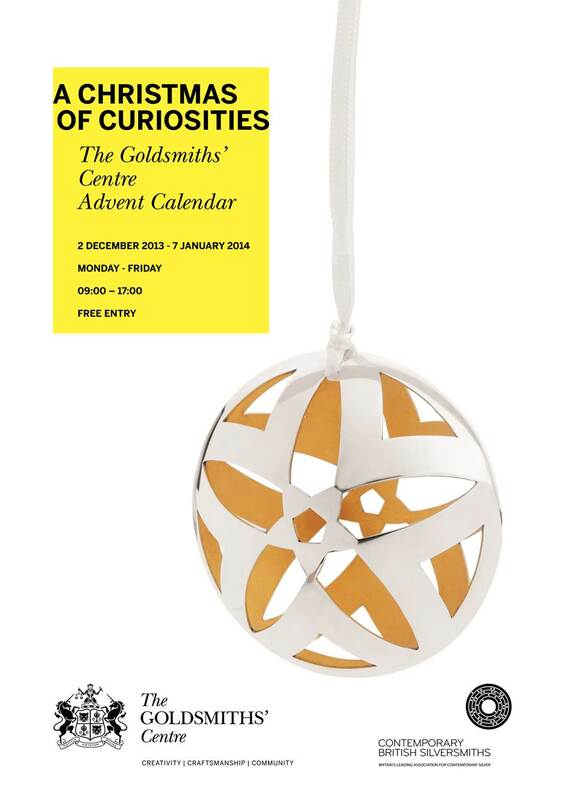 Once again, Contemporary British Silversmiths is exhibiting its annual collection of beautiful silver Christmas decorations and objet’s d’art at the Goldsmiths’ Centre in London. The Goldsmiths’ Centre is bringing a new twist to the traditional Advent Calendar this Christmas as beautiful, hand-made Christmas decorations and curiosity pieces go on display, in a wooden Advent Cabinet in the heart of London’s jewellery quarter with pieces available for sale through Contemporary British Silversmiths’ online shop. A new door will be opened every day to reveal one of 24 limited-edition pieces, designed and crafted by Contemporary British Silversmiths – a real festive treat for collectors of contemporary craftsmanship and anyone with a passion for leading design. The beautiful pieces, made by award-winning, young silversmiths provide an exciting alternative to items from more traditional, high-end jewellers; and with prices ranging from £60 – £200 each item can be purchased as a personal and timeless gift for someone special. Curiosities featured in the Advent Cabinet will include beautiful decorations – from a Madonna and Child to a silver Guiding Star; silver spoons – from the deceptively simple to the ornate; and tiny objects of desire worthy of any Christmas stocking . The decorations vary from tree ornaments to table decorations. The Advent Cabinet will be the centre-piece of a stunning Christmas display at the Goldsmiths’ Centre from 1st to 24 December. Shoppers will be able to see a wide range of artisan silverwork and enjoy a glass of bubbly or a meal at the Centre’s Bench cafe. The silver objects featured in the Advent Cabinet are created using a variety of processes, from the traditional methods of raising and hammering to modern computer-aided techniques. Members are represented in prestigious national and international collections such as the Silver Trust’s collection, used at 10 Downing Street; The Goldsmiths’ Company Collection and the Victoria and Albert Museum. Each week in December a prize draw will give winners the chance to be the next person to open the Advent Cabinet and enjoy a glass of bubbly and a festive treat at the Goldsmiths’ Centre’s Bench Cafe. Each winner will go into a final draw to win one of the beautiful curiosities on display. To enter email info@goldsmiths-centre.org, tweet us @GsmithsCentre with #adventtreat or send a message to the Goldsmiths’ Centre on their Facebook page to be in with a chance to open one of the doors. To view the Advent Cabinet, gallery of pieces and the full range of handmade silver, visit the Goldsmiths’ Centre at 42 Britton St, London EC1M 5AD from 10am to 5pm, Monday to Friday (until 23 December). The Contemporary Christmas cabinet will be on display from 1 December to 23 December 2013.